The other day I was asked to write about how I approach public speaking from an organisational point of view. Things like “do you have a general roadmap”, “how do you start creating your slides” or “do you use spreadsheets“ and so on. I thought this was really interesting, so here we are, without further ado: tips on how to keep your life as a public speaker organised. 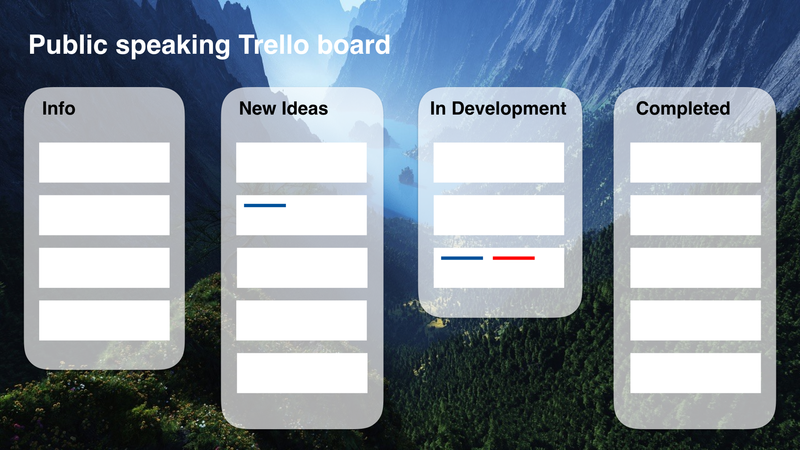 Just like almost everything else in my life, it all starts from a Trello board. My Trello board for public speaking helps me navigating across the grand scheme of things: biographies, headshots, speaker media kit, talk titles & abstracts. The first column on the left has static info as well as a bit of meta—always explain how to use the board as it has to be accessible to mentors or colleagues. As I write this article, the Info column has four cards: a readme with instructions, a card for the Speaking Media Kit with the link to Dropbox (I’ll talk about this later), my biographies, and the abstract structure. Second, third and fourth columns are New Ideas, In Development, Completed. Every card in those three columns is a talk, with the abstract in the description and everything else—comments from peers or mentors, checklists, links, attachments and so forth—where appropriate. Every time I have a new idea for a talk I just create a new card in the New Ideas column. There’s no such thing as Hmm, shall I add this here? Hmm… not sure if… hmm… at this stage. Wild ideas must be encouraged. You never know. The In Development column have only talks that I’m currently working on. Might be talks that have been accepted for an event, talks that I’m preparing before applying with them, or talks that already exist in some incomplete form for some reason. When a talk is in this column I want slide deck and speaker’s notes to have enough meat as soon as possible. When the talk reaches that stage (talk ready to be delivered, but if there’s time I’d appreciate the opportunity to give it some extra love), I apply a label to it, which I named “MVP” (buzzwords, yay), but remains in the In Development column. The Completed column has only talks that are ready to be delivered or have been already delivered. Talks are moved around among those three columns, with the usual movement being left to right—New Ideas ➡️ In Development ➡️ Completed. Labels help a lot with the process. No label means it’s a regular 30–40 min talk. Labels can include workshops, lightning talks, flash talks, keynotes, “MVP”, etc. You’re probably asking why biographies. The answer might be more than one, notably type of events (I’ve got a bio specifically for WordPress events), and languages. Always keep them updated and make sure they reflect the speaking application you’re putting together: if you’re applying with a talk about business development, make sure your bio highlights your experience with business development. My abstracts usually have three short paragraphs. In the first paragraph I define a problem, an issue, a current situation worth talking about. In the second paragraph I propose a solution, which normally is the major part of the content of the talk. The third one is all about the ideal audience (answering the question “who’s this talk for?”). I have a “Public speaking” folder on my computer, which is sync’d to my Dropbox account. This folder has two folders inside: the Speaker Media Kit and the Talks folder. The Talks folder has one folder per talk, and every talk has a “Images” folder (with all the image files that I use in the slide deck), and the Keynote presentation(s). Why plural? Because if I give the talk at different events the deck will inevitably change (from the event hashtag to cultural adjustments). To recap: Public speaking ➡️ Talks ➡️ Talk name ➡️ Images folder & keynote file. When I start creating a presentation for a new talk, I don’t want to start from scratch. No one likes blank pages, and let’s be honest here, some elements are common across different presentations—every slide deck has at least a cover and a final “thank you” / “questions?” page, right? In my Talks folder there’s a “Starting deck” folder, which is set up in the exact same way of other talks: an “Images” folder, and a Keynote file. The Keynote file has a cover (with dummy title, subtitle, hashtag and background, plus my Twitter handle and company logo), a slide about me, a couple of slides about Human Made, and a final “thank you” slide. Every time I have to do a new talk, I will go to Trello and make sure the talk is in the In Development column, then duplicate the Starting deck, move it to its talk folder that I had created beforehand, and give the file the right name. It’s definitely easier and quicker to do it rather than to explain! I mentioned the Speaker Media Kit a couple of times already, and it’s time to go a bit deeper on this. A SMK typically is a folder that has your biography, headshots (include only those you’re happy with, as they’re going on the event’s marketing campaigns, website, etc. ), contacts, speaking topics (all the topics you’re comfortable speaking about, with some issue / solution-based explanation, very similar to talk abstracts), and testimonials. It’s particularly useful when event organisers want your complete profile as a speaker. An alternative to have separate files is a “Speaker sheet”, which has everything in one single PDF file. I’m a fan of this solution, in fact my SMK has only a PDF and a folder with headshots. I would love to know how other people involved with public speaking keep everything organised. There are a million ways to do this, so please do weigh in with your processes or feedback in the comment section! Thank you Matija, glad you’re finding this post useful!